Goa without a second thought is one of the most visited destinations in the country. The place has a wonderful mix of land and water and offers the best of both. 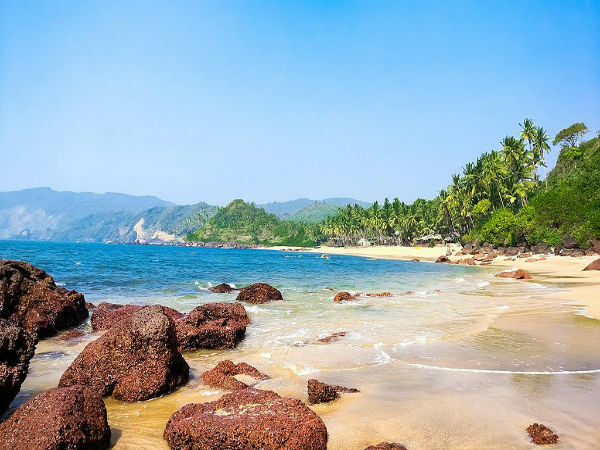 However, it is the beaches in Goa, where one can laze around in the sun kissed sands and be taken away by the beautiful sunsets and spectacular landscapes. It is one of the most visited travel destinations not only by Indians but also by people from across the globe. As a matter of fact, it is loved for the puzzling north and south regions. While the Northern part is for those who love to party, with its beaches jumping with high energy even through the dead of the night, South Goa is the opposite; it is quieter, with serene beaches and fewer people around. Take a look at some of the most popular beaches in the southern part of the state. With the Majorda Beach in the south and Bogmalo in the north, the Velsao Beach is a large beach with silvery fine sands. This beautiful beach is one amongst the most popular beaches in South Goa. The shores are dotted with palm tress and the sea remains warm with soft sand and fresh air which would rejuvenate you to the fullest. The Velsao beach is located at a distance of approximately 14 km away from Margao. The Agonda Beach is a versatile one, where one can enjoy sunbathing and swimming and to top it all, it is a perfect place to relax. The beach is a flawless long stretch of sandy shore, about a 90 minute drive from the Dabolim Airport, which would take you to the Agonda Beach. The place is a remote seashore and is a boon for those who come looking for secluded places. The major attraction here is the simplicity and the natural beauty of the place. The beach is also considered as home to the endangered species of the Ridley turtle. A curvy sandy beach which is beside a small fishing village, Bogmalo is a beach for those who come looking for peace and silence. The beach is broad, open and flat which gives it a very appealing sight. One part of the beach is filled with coconut groves; you can also find a number of shipwrecks in the area. The most popular activity at the beach is windsurfing which draws quite a large number of visitors every single day. The adrenaline pumping activity requires one to have open sailing and surfing skills. Situated in the Salcette region, Arossim Beach is about 12 km away from the city of Margao. The palm bordered, white sand beach is well known for water sports. The place is also well known amongst those who would love to spend some quiet time away from the hustle and bustle of a metro city. The Fatrade Beach is a white sand beach with a shallow ocean floor. The total length of the beach is around 30 km and has a shoreline of about a kilometre long. The beach is a perfect place for a laid back holiday with its blue green ocean and cool breeze. The place does not have many restaurants and shacks unlike the other beaches, which further add on to its peaceful atmosphere. Situated in Canacona which is about 40 minutes away from Margao, this beach has one of the unspoilt stretches of sandy shores. The beach would embrace you with it natural beauty and the rocky structures which are covered by trees on one side; the place is locally known as the Green Island. The beach takes the shape of a crescent, with its northern end being shallow and the depth gradually increases. In the Hollywood film Bourne Supremacy, the protagonist Matt Damon's home is shown to be located here, which has made this place one of the most popular beaches of the country. Located close to the northern end of the Patnem Beach, the Colomb Beach is a horseshoe shaped bay which is clean and beautiful. The beach is a perfect place for people who come looking for a relaxing and peaceful place to spend their holiday. A rock formation named Neptune's Point at the northern end of the beach divides Colomb from Palolem. Patnem is another beach in the region where one could sunbathe, laze around and take a stroll across the shore. The beach provides a more laid back and relaxing atmosphere in comparison to the popular Palolem Beach. The white sand along with its crescent shaped sea shore is preferred by alternative travellers and by the long term visitors. The beautiful beach of Utroda lies close to the popular Colva Beach. This palm fringed beach is long and has soft golden sand and is also considered as one of the most beautiful beaches in the region. The beach is one amongst those which are considered to be safe for swimming. Hollant is one of the lesser known beaches of South Goa. The beach is situated in the south of the Bogmalo beach; the seashore here is mostly preferred by families as it has a shallow draft of water. The beach is also considered worthy for one to go swimming; one can also find a number of shacks which offer some yummy seafood.